Another test required for the concentrating collectors is the determination of the collector acceptance angle, which characterizes the effect of errors in the tracking mechanism angular orientation. This can be found with the tracking mechanism disengaged and by measuring the efficiency at various out-of-focus angles as the sun is traveling over the collector plane. An example is shown in Figure 4.8, where the angle of incidence measured from the normal to the tracking axis (i.e., out-of-focus angle) is plotted against the efficiency factor, i.e., the ratio of the maximum efficiency at normal incidence to the efficiency at a particular out-of-focus angle. 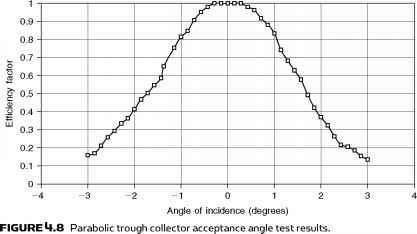 A definition of the collector acceptance angle is the range of incidence angles (as measured from the normal to the tracking axis) in which the efficiency factor varies by no more than 2% from the value of normal incidence (ASHRAE, 2003). Therefore, from Figure 4.8, the collector half acceptance angle, 0m, is 0.5°. This angle determines the maximum error of the tracking mechanism. A last aspect of collector testing is the determination of the heat capacity of a collector in terms of a time constant. 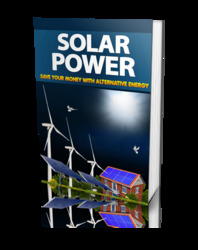 It is also necessary to determine the time response of the solar collector in order to be able to evaluate the transient behavior of the collector and select the correct time intervals for the quasi-steady-state or steady-state efficiency tests. Whenever transient conditions exist, Eqs. (4.9) to (4.14) do not govern the thermal performance of the collector, since part of the absorbed solar energy is used for heating up the collector and its components. Tot = collector outlet water temperature after time t (°C). Tof = collector outlet final water temperature (°C). Ti = collector inlet water temperature (°C). FIGURE 4.9 Time constant as specified in ISO 9806-1:1994.
radiation by means of a solar reflecting cover, or in the case of a concentrating collector, the collector is defocused and the temperature of the heat transfer fluid at the collector inlet is set approximately equal to the ambient air temperature. 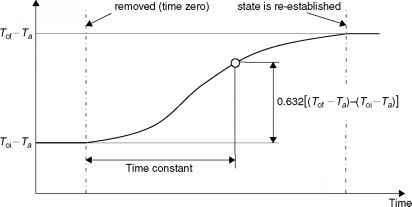 When a steady state has been reached, the cover is removed and measurements continue until steady-state conditions are achieved again. For the purpose of this test, a steady-state condition is assumed to exist when the outlet temperature of the fluid varies by less than 0.05°C per minute (ISO, 1994). The difference between the temperature of the fluid at the collector outlet at time t and that of the surrounding air (Tot - Ta), (note that, for this test, T = Ta) is plotted against time, beginning with the initial steady-state condition (Toi - Ta) and continuing until the second steady state has been achieved at a higher temperature (Tof - Ta), as shown in Figure 4.9. The time constant of the collector is defined as the time taken for the collector outlet temperature to rise by 63.2% of the total increase from (Toi - Ta) to (Tof - Ta) following the step increase in solar irradiance at time 0. Toi — Ti e where Toi = collector outlet initial water temperature (°C). The graph of the difference between the various temperatures of the fluid in this case is as shown in Figure 4.10. 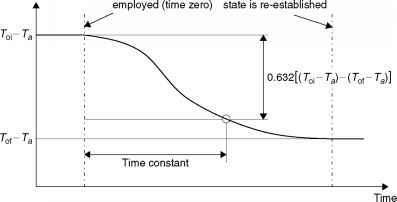 FIGuRE 4.10 Time constant as specified in A5HRAE 93:2003. The time constant of the collector, in this case, is the time taken for the collector outlet temperature to drop by 63.2% of the total increase from (Toi - Ta) to (Tof - Ta) following the step decrease in solar irradiance at time 0 (ASHRAE, 2003). Qu = no [K,bGb + K,dGd] - a0(T - Ta) - ax(T - Ta)2 - cdT (4.34) L J dt where r|o, a0, ab c, and the coefficients Ke,B and Ke,D are determined by the correlation of the test measured data. Equation (4.34) is similar to the second-order equations used for steady-state testing, presented earlier in this chapter, with the addition of a transient term and incident angle modifiers for both beam, KeB, and diffuse, Ke,D, radiation. Models that are more complex can be used if the testing program can cover an extended range of operating conditions. In any case, the measured transient data are analyzed using a procedure that compares a set of model coefficients that minimize the deviation between the measured and predicted output. 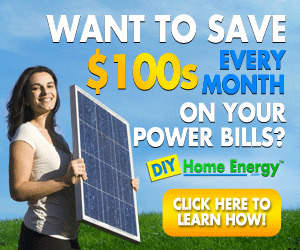 The method should be such that the various parameters should be determined as independently as possible. To be able to satisfy this requirement, sufficient data are needed; therefore, it is required to control the experimental conditions so that all variables independently influence the operation of the collector at various periods during testing. Additionally, a wide range of test conditions is required to determine the incident angle modifiers accurately. An added advantage of the method is that the equipment required is the same as the steady-state testing shown in Figures 4.1 and 4.2, which means that a test center can have the same equipment and perform both steady-state and dynamic testing at different periods of the year, according to the prevailing weather conditions. The primary difference between the two methods is that, in the dynamic method, the data are recorded on a continuous basis over a day and averaged over 5-10 min. Due to the wider range of collector parameters that can be determined with the dynamic method, it is likely that it may displace the steady-state testing method, even for locations that have clear and stable climatic conditions.